Spring has almost sprung - officially it starts on 1st September but already our valley is even more alive with birds and the dawn chorus is getting louder and louder. 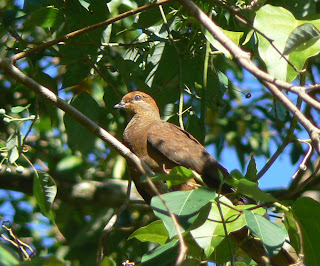 This Brown Cuckoo-Dove was busily feeding on rainforest fruits a couple of days ago and yesterday we saw and heard a couple of Double-eyed Fig Parrots in the Tahitian Apple tree outside the office - the one in which we had nesting parrots last year (see Archive - Double-eyed Fig Parrots). So fingers crossed that they may nest there again this season.